The small town of Trebic is about two hours southeast of Prague in the Czech Republic, and the thing to see in Trebic is its UNESCO site. When I say “UNESCO site” though, I’m really referring to three sites that UNESCO has combined into one: the old Jewish Quarter, the old Jewish cemetery, and a Catholic Basilica. While this seems a strange combination, UNESCO’s World Heritage website explains it in terms of the historically peaceful coexistence of the two communities. 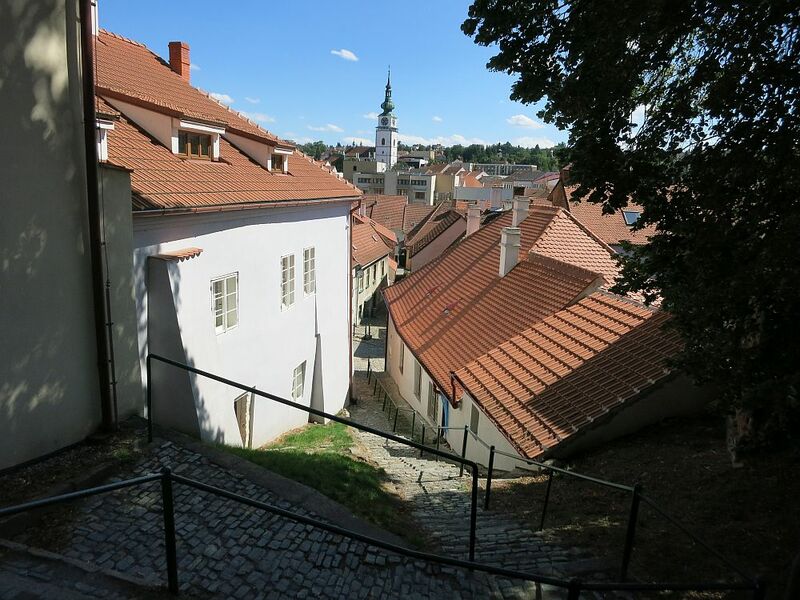 Jews started settling in Třebíč (as it’s properly written) in the Middle Ages, living relatively peacefully among the majority Christians in the town. They were craftsmen (especially tanners) or traders. 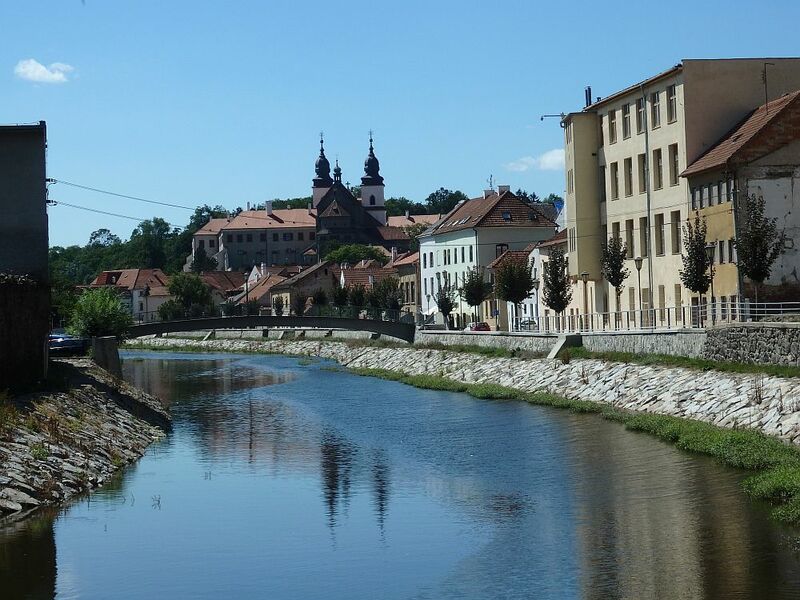 However, in 1723, the local noble, Jan Josef von Valdštejn, ordered the Jews and Christians to exchange houses so that the Jews would be limited to an area on one side of the Jihlava river. He also limited the number of families living there. This situation lasted until this law was abolished in 1849. After that, some of the wealthier families moved away or to other less crowded parts of town. The housing in the Jewish Quarter became more mixed again. World War II, however, spelled the end of the Trebic Jewish community, with only 10 of the 281 Jews who had lived in Trebic surviving the war. Trebic Jewish Quarter’s small buildings remain: tightly packed together along cobbled streets in a charmingly jumbled way. Some still have the original vaulted ground floors that were (and in some cases still are) used for commercial purposes or as workshops. These ground floor spaces offered (and still offer) access to the residents of the apartments upstairs. Make sure, if you visit, to keep an eye out for any that have been left open. Take a peek in to see the old stone vaulting. Visitors can enter one of the original two synagogues, called the Rear Synagogue, dating from the 19th century. 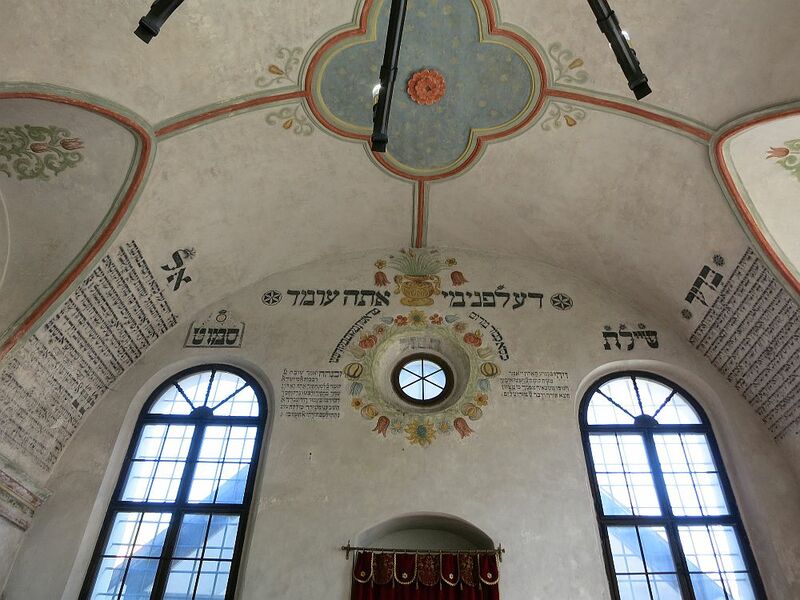 The inside of the Rear Synagogue in Trebic, Czech Republic. You can see the top of the ark of the torah at the bottom of the photo. One house next to the Rear Synagogue is now a museum: Seligmann Bauer’s House. We were not able to see it when we visited, but it apparently shows a “typical Jewish household” in the Jewish Quarter. The other synagogue, called the Front Synagogue (17th century) is now home to a Czechoslovakian Hussite church. 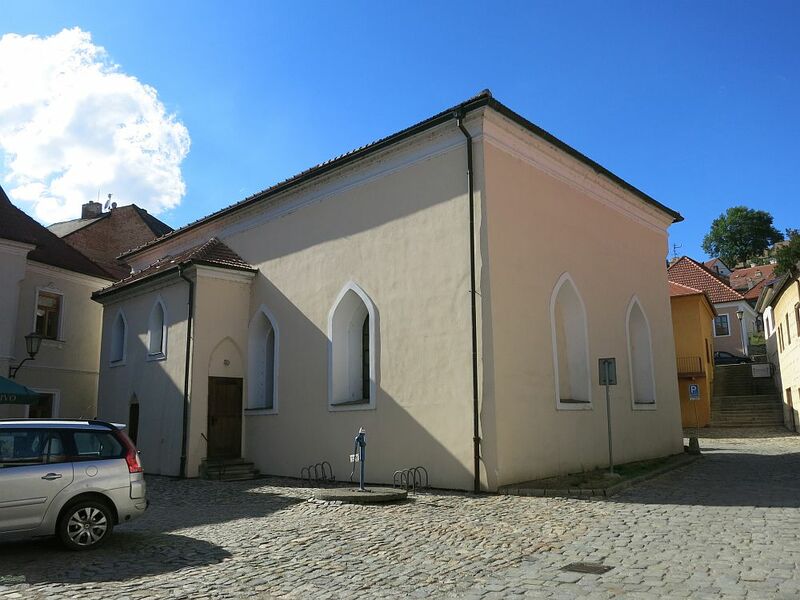 This 17th century synagogue is now home to a Czechoslovakian Hussite Church. 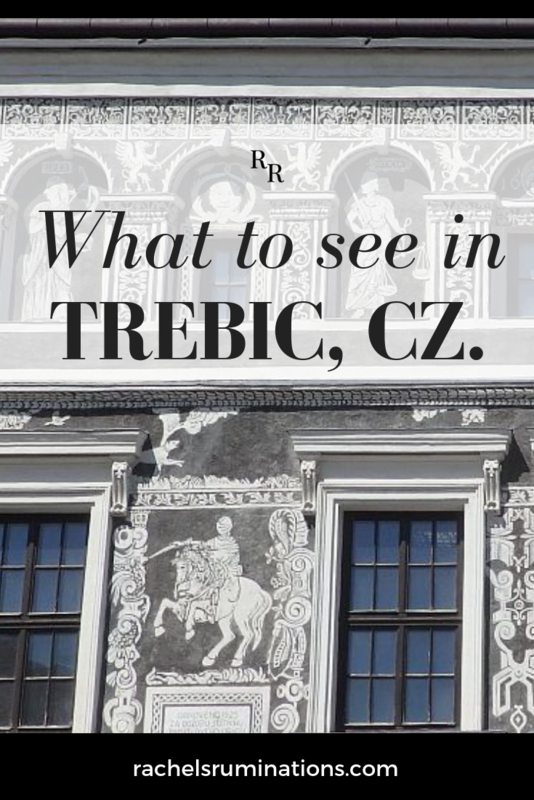 You can walk between the three parts of Trebic UNESCO site. The Jewish Quarter extends along the riverbank, while the Basilica looms from a small hill further along the river. You can get to the Basilica by climbing a path up the hill. a view into the Jewish Quarter from partway up the path. The tower in the distance is on the other side of the river, beyond the Jewish Quarter. Built in the 13th century, St. Procopius Basilica was originally part of a Benedictine monastery. The UNESCO description calls it “one of the first examples of the influence of Western architecture in Central Europe.” While the front has white plaster and gothic arches, the back, where the stone structure is visible, betrays its medieval origins in Romanesque style. The front of the church itself, seen from inside the Basilica compound. If you walk up there, make sure to go to the garden behind it, where you’ll find a great view over the rooftops of the Jewish Quarter. 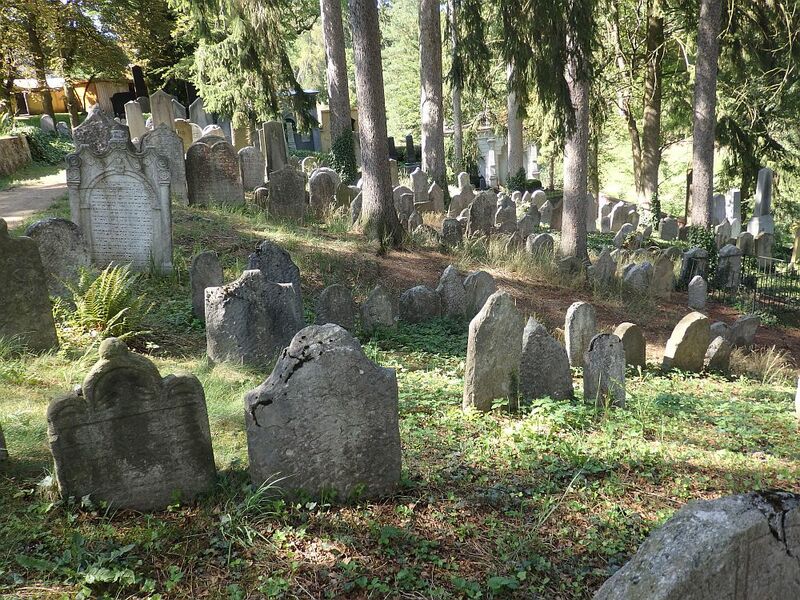 The third part of Trebic UNESCO site is the Jewish cemetery, up a hill away from the river. It’s not as dramatic at the Jewish cemetery in Prague, probably because the community was allowed much more room to bury their dead in Třebíč. Nevertheless, it makes for a meditative walk among the stones under the trees. Opened in the 17th century, some of the gravestones are ornately carved in the Baroque style. 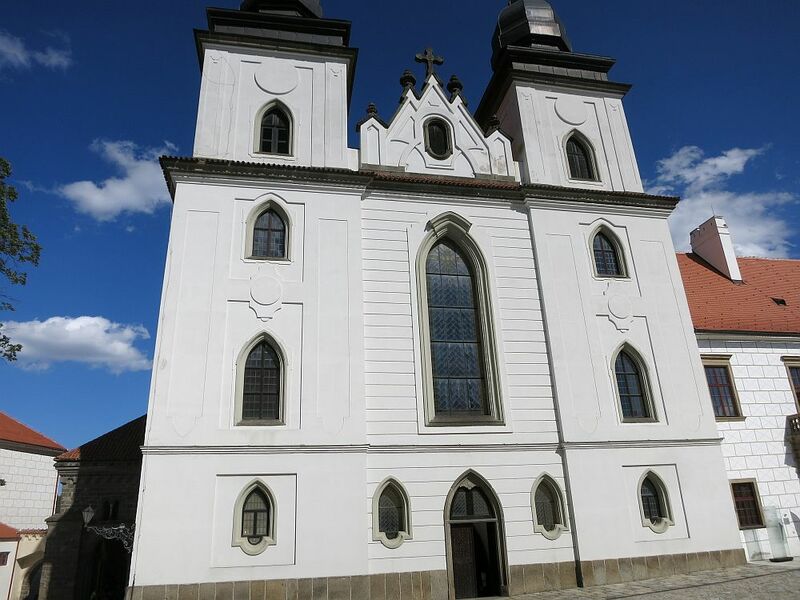 While the UNESCO site consists of just the Jewish Quarter, the Basilica and the Jewish cemetery, the town of Trebic, on the other side of the river, is worth seeing too, with some lovely restored sgraffito and painted buildings. Sgraffito is a technique in which the artist uses different colors of plaster, rather than paint. 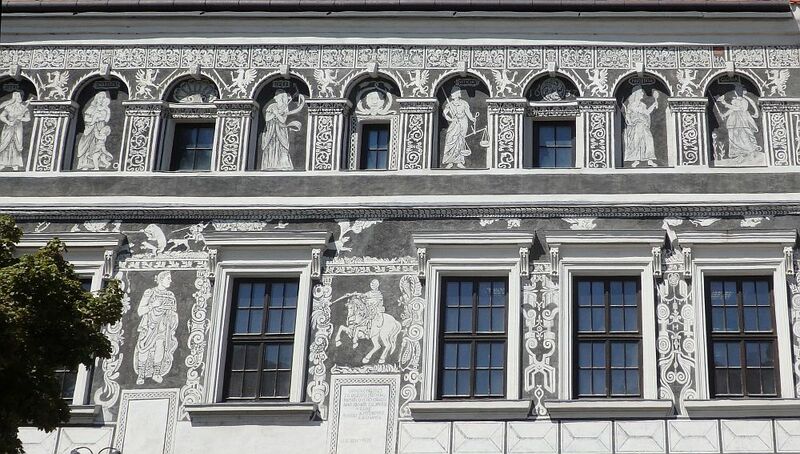 This building, the Rabl house, was the most ornate one that we saw on our visit to Trebic UNESCO site. The sgraffito dates to 1637. The large main square, Karlovo Square, built in the 14th century, is ringed by a collection of historical buildings. 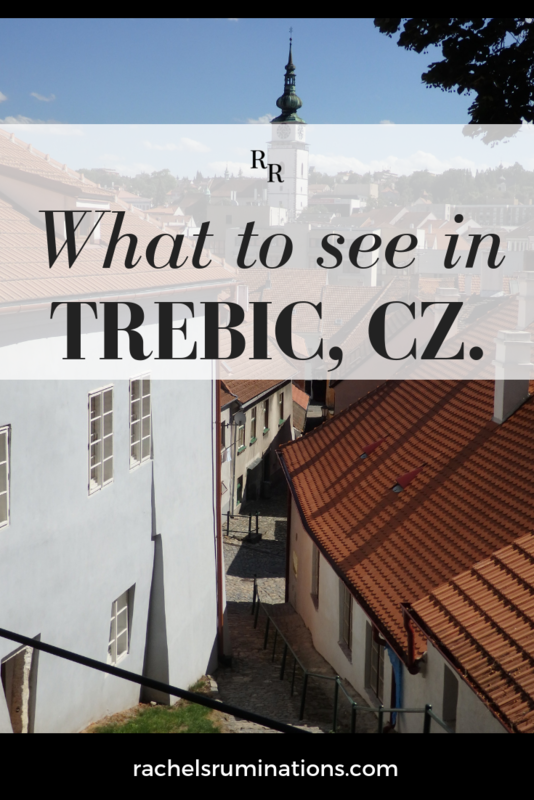 Getting there: If you have a car, Trebic is about two hours on route E50 from Prague. From Brno it’s about an hour, taking the E50 and then the 360. You can take a train from Prague, but the route will involve at least one transfer and will take three to four hours. From Brno there are direct trains that take an hour. From the train station in Trebic you can walk to the Jewish Quarter in about 15 minutes, and you’ll pass Karlova Square on your way. Of course, the easiest way is with a tour from Prague. 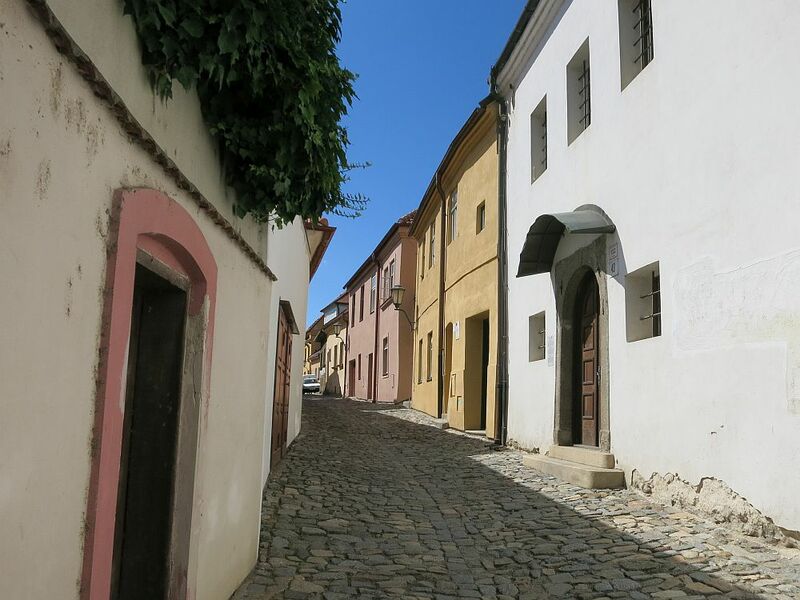 The Jewish Quarter: Trebic is a living town, so there’s no entrance fee to see the Jewish Quarter. Rear Synagogue: Admission is 50CZK (€2) without a guide. To view the Seligmann Bauer’s House as well costs 120CZK (€5). Tours are offered on the hour except at noon. Open daily January-June and September-November 9:00-17:00, July-August 9:00-18:00 and December 9:00-16:00. St. Procopius Basilica: Admission is 100CZK (€4). Tours are offered on the hour except noon. On Fridays, the last tour is at 14:00 and on Saturday and Sunday they are only run in the afternoons. Tours may be cancelled in case of church ceremonies. Open June-September: Monday-Friday 9:00-17:00, Saturday and Sunday 10:00-18:00. Open October-May: Monday-Thursday 9:00-17:00, Friday 9:00-16:00, Saturday and Sunday 10:00-17:00. The Jewish Cemetery: Free admission. Open daily: May-October 9:00-18:00, March and April 9:00-17:00, November-February 9:00-16:00. Please consider sharing this article on social media!